Cravin’ for burgers? 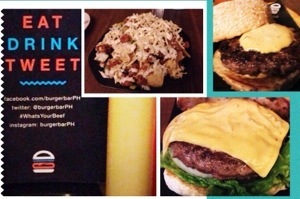 Come on by to Burger Bar at Greenbelt 2, Makati City Philippines. They have different burger types – from the plain good ol’ burger to the gourmet style burger – cooked and served just the way you want it, with skinny fries and drink to match! Try the specialty burgers as well, such as the Hangover burger, the Bleu, the Piggy.. And if you want to make your own burger, then choose the You’re the Boss. Burger Bar is not limited to their quarter-pounder burgers. They also have pasta, rice meals, appetizers, milkshakes and desserts. An absolute must try are the nachos and the dessert in a jar. They have the best Tex-Mex Nachos loaded with cheese, ground beef, salsa, beans, avocado, and its oh-so-yummy sauce. A single serving is good for 4 people. The caramel vanilla bread pudding in a jar and the molten chocolate bottoms in a jar desserts are heaven-in-your-mouth!